Each of our online courses contain tests and homework assignments, but what’s involved? At the end of each lesson you’ll find a multiple-choice test. These mini exams are there purely to confirm that you have fully grasped the course material. All of the answers can be found within that lesson’s text and/or videos, so they’re very straight-forward to work through. You’ll also need to complete a homework assignment following each lesson and submit it for your tutor to mark and provide feedback. This work will either be theoretical, practical or a mix of both. Practice the head and forehead points demonstrated in this Lesson. 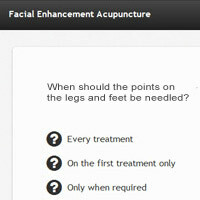 Please also include those that are mentioned on the eyebrow, ideally using intradermal needles. When you have mastered these, please submit a photograph in jpeg format showing a patient with these needles inserted. In this Lesson we looked at a range of auricular points and discussed their importance in relation to Facial Enhancement Acupuncture. Please research 5 auricular acupuncture points (not already listed in this lesson) and describe how the use of each point could bring benefit to a patient during a cosmetic acupuncture treatment (approximately 500 words). The courses are structured so that each stage must be successfully completed, before moving onto the next lesson. This ensures that you get the most from your training and demonstrates to us that you’ve mastered each step. We find that our students really enjoy the assignment aspect of our courses and the direct access they have to their tutor throughout their studies. That is an amazing demonstration and I’m very excited to be able to now introduce this to clients, you have made the detail of this course very easy to learn and understand. I thought your course was well organized and very informative. I found the videos to be very helpful in terms of putting what was written into practice and seeing the rhythm with which you work. The course content was fluid and the video footage extremely useful. I have really enjoyed the alternative acupuncture perspective.